The best way to prepare for any regatta is to gather information and find out what’s worked well in the past. I talked to the 2014 winners of the Bayview Mackinac Race in search of tips that could help you get your boat and crew ready for the next race. Here’s what the winners had to say, as well as some of my own tips. Congratulation on last year’s finish. Was your finish more luck or good preparation? The majority of owners and skippers felt they were well prepared for the race. The teams that did well made their own luck by setting themselves up for fortunate outcomes. Good race plans and the willingness to adjust strategies provided enough luck to help these teams win. Can you list specific things that contributed to your finish? Reaching sails, good watch systems, changes in strategy, experience, routing, speed, wind shift, and luck were just a few of the answers I received. There are many combinations of these that add up to a great finish. How did you research weather? Some of the winners looked at the weather a week prior, while others waited until race day. What watch system did you use? Most skippers agreed: a watch system is most important near the end of the race. There was no question that the teams that were well-rested performed better than the boats that tried to sail without rest. The majority of owners liked sailing with two teams rotating four hours on, four hours off. Others liked bringing up one or two crew each hour, or two around-the-clock to not disrupt the boat. One consistent class winner believes he has a team that works well from midnight to 4 a.m. while others like to change the rotation each day. A system that encourages rest early in the race is much better than no system at all. Regardless of your system, you need a good helmsman, trimmer, and bow person on each watch. Was there a particular sail that helped? The majority of the teams agreed that there was not a secret weapon, but having a good sail that can reach was necessary. A code 0 was a nice sail to have not only reaching, but also when the wind turned light. Do you have a cross over chart? Only one team had a sail cross over chart. All agreed that sail changes were based on past experience and a gut feel. Do you sail polar angles and speed? Two boats had information on polar angles and speeds, but none of them said they used that information. All agreed that sailing by the seat-of-their-pants worked. All the boats have sailed numerous Mackinac races and felt they understood the proper angle and speed to sail. Did you follow an early strategy? Did you have to change your strategy during the race? All of the boats admit to having a strategy based on weather and past experience. Half the boats stuck to their strategies while others adjusted based on early tactical decisions. 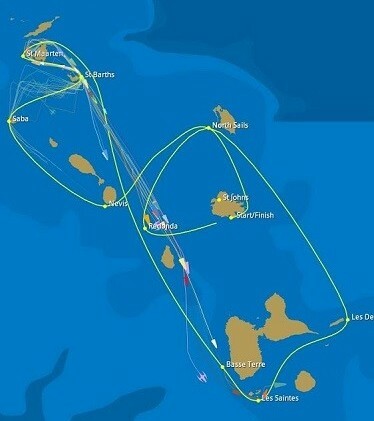 The time of day also had an impact on the decisions made during the race: all the shore-course winners made gains sailing close to shore during the day. It’s great to have a sound strategy, but weather and timing sometimes make it necessary to alter the strategy up the course. What do you do at night to stay fast? Are you sailing the favored board? Do you have the proper sail up? Are you steering and trimming optimally? Most of the boats used flash lights to illuminate telltales to help with trim and steering. Some of the winners relied on the instruments to help steer and trim. Do you look at Yellow Brick Tracking? If so, how often? They all tracked their progress against their competitors with Yellow Brick, which has changed the sport of long distance sailing by allowing sailors to track the competition. It’s something all boats should do to see if your strategy is working. The only problem for the Cove Island course boats was the lack of internet coverage – one boat spent $4000 on satellite service to use Yellow Brick. Do you clean the bottom of your boat prior to the race? All the boats are cleaned either the day before or before the start, minus one. One skipper uses a paint that does not need cleaning prior to any race throughout the entire year – sounds too good to be true! How many crew do you race with? Most of the boats race with 8-14 crew members depending on the size of the boat. The talent of the crew was more important than the number though. Many of the teams made sure there were at least two good helmsmen per watch. What will you do better this year? Most of the skippers were secretive regarding this year’s improvements, but I know each of the owners I spoke to will make sure their boats, sails, electronics, and crew are ready. There are no secrets to sailing, and there are no absolute answers either. After speaking with each skipper it’s clear that each winner had a system they have perfected over years of sailing. It is the individual belief of each team that good things will happen when they use their system.